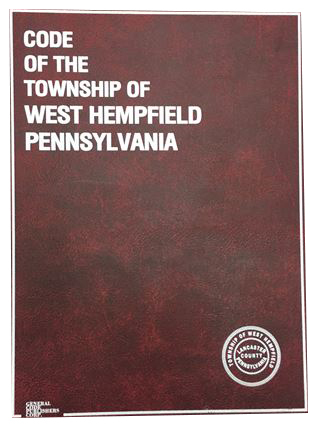 * West Hempfield Township maintains copies of the ordinances and maps on this website as a convenience to the general public. Every attempt is made to maintain this website with current regulations. However when amendments and/or revisions occur, it takes time to update these files. Therefore, anyone relying upon ordinance language and zoning districts contained on this website is instructed to verify its authenticity with West Hempfield Township staff prior to its use. West Hempfield Township is not liable for the accuracy or completeness of any information contained on this website. Any documents posted on the website are for informational purposes only. The true and actual copy of any posted ordinance is maintained at the Township building and can be reviewed during normal business hours. Reliance on the accuracy or completeness of the information contained on the website is at the user's risk.